The apartment has been renovated and the kitchen and bath are pretty swank. 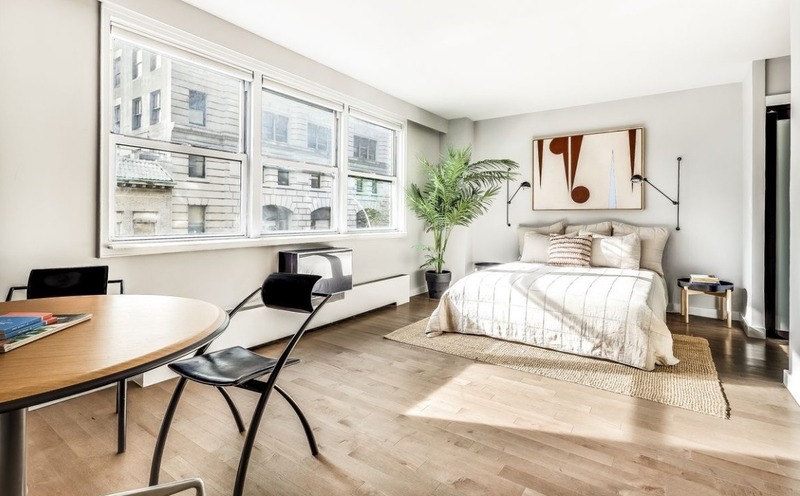 This Gramercy Park studio probably checks all the boxes on your wish list: A living area that gets lots of natural light, a separate sleeping alcove, a kitchen with tons of cabinet space, and a bathroom that looks straight out of a high-end hotel. 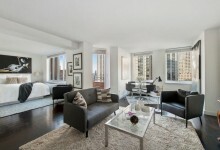 All of these make 145 East 15th St., #4B, worth checking out. But it’ll definitely cost you. 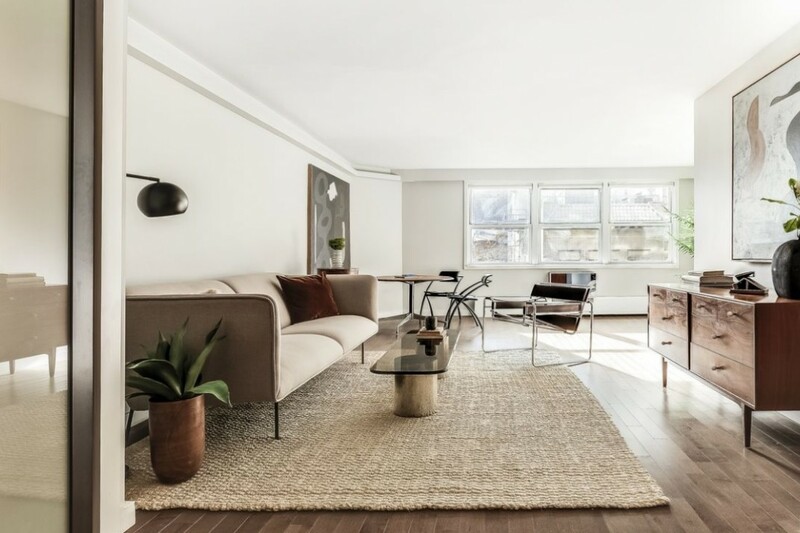 At $625,000, it is well above the $549,000 median for a studio in the neighborhood (and even higher than the $555,000 median for all studios in Manhattan), according to StreetEasy. 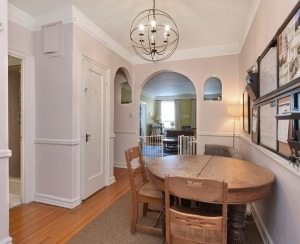 If you're considering converting this to a one-bedroom, note that the alcove's width of just over seven and a half feet makes it too small to be a legal bedroom. 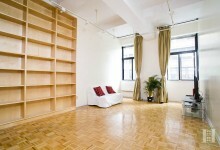 The living space, like the rest of the apartment, was recently renovated. It has dark maple hardwood floors and room for a decent-sized seating area, as well as a small dining space in the corner by the windows. There are also a couple of large closets fronted by frosted glass, giving a polished look to the room. 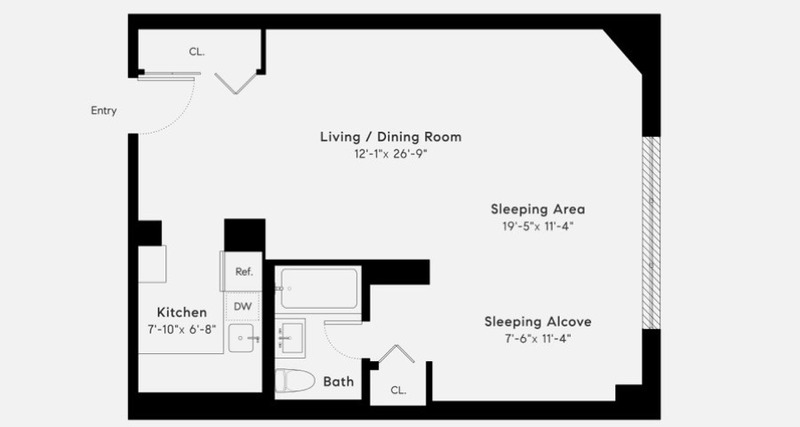 Across from the dining area is the sleeping alcove, a small yet smart space with room for what appears to be a queen-size bed (at least), as well as a pair of night tables on either side of that bed. 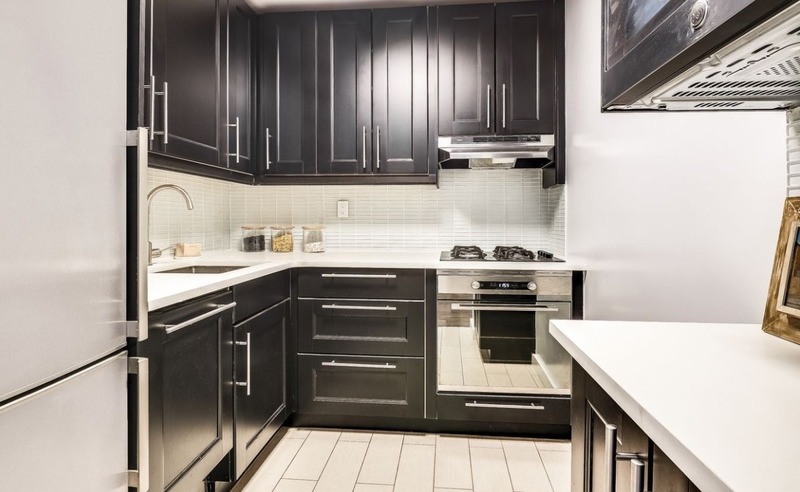 The kitchen is fairly sizeable for a studio, and has shiny new stainless steel appliances, a dishwasher hidden behind a panel, and a surprisingly large number of pristine-looking dark wood cabinets. The rest of the space is fairly light in color, with white countertops, a white tiled backsplash, and tiled floors. Although a tad bit cramped, the bathroom is lovely to look at. 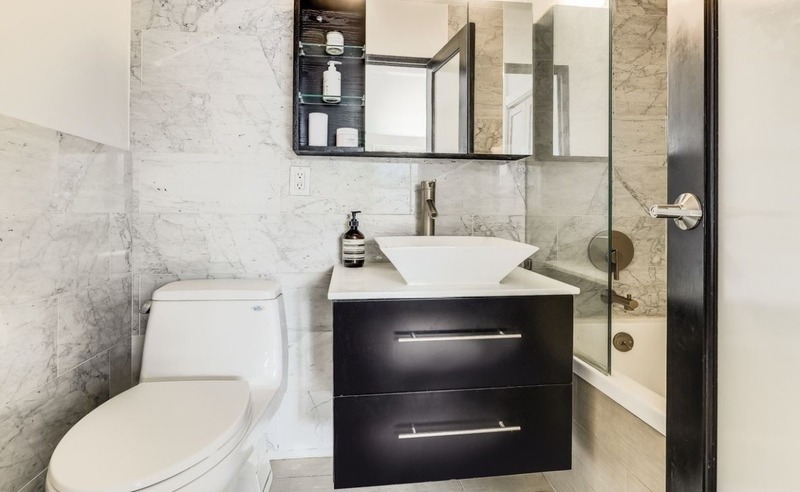 There’s an extra-deep bathtub behind a European-style single glass panel, a vessel sink atop a floating dark wood vanity (tying it together nicely with the kitchen), and on the wall, white marble tiles with gray veining. 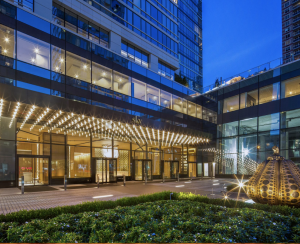 The studio is in the Gramercy Arms, a pet-friendly co-op building with a renovated lobby, a 24-hour doorman, a laundry room with new washers and dryers, a storage/bike room, three elevators, and direct access to the parking garage through the basement. Pieds-à-terre and parents buying for working children are permitted. 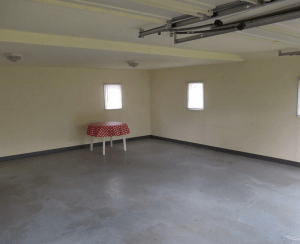 There’s also a limited sublet policy with board approval. Maintenance is $1,079 a month. 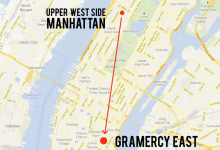 It’s close to Union Square, where folks can catch the N, Q, R, W, 4, 5, and 6 trains, and a host of grocery stores, including Whole Foods, Trader Joe’s, Food Emporium, and Westville.